For BK & WH + AM, BR, BE, BR, CR, CO, CST, CT, EGG, FG, FX, G, GP, GR, GY, K, L, LB, LC, N, O, OL, PER, PK, PU, R, RS, SE, SI, SLV, SR, SS. If a color is sold out and no longer available in the larger spool, we will send you 2 smaller spools. For BK & WH + AB, ARG, BE, C, CB, CEL, CHA, CHO, CO, CPR, CST, FL, GM, GO, GP, GR, IB, IND, LB, LO, MB, MG, N, NK, NT, OG, OY, PU, S, SG, TL, TQ, VA, VR, WN. Notes - * The Fine Weight color does not match the same color in other sizes. AB Antique Brown in Fine Weight Tex 135 is golder and closer to Sable but lighter. MG Marigold does not match Marigold in other sizes. In Fine Weight Tex 135, it is in between Marigold and Aurum. 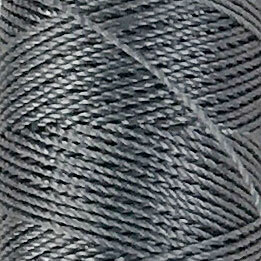 The C-Lon Fine Weight Bead Cord Tex 135, although designed for the bead, micro macrame & fiber jewelry world, is a thread that can be used for many other applications including for industrial sewing.